For a free estimate on waterproofing your concrete block wall basement, call or e-mail us today! 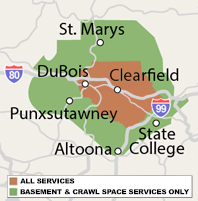 We serve all of Pennsylvania, including Saint Marys, Bellefonte, Altoona, State College, Du Bois. At Bowman Masonry & Waterproofing, we've seen this problem throughout the region. For a free estimate on a basement waterproofing, call or contact us online today! Repairing wet concrete block walls is part of what the basement contractors at Bowman Masonry & Waterproofing do every day. The basement waterproofing process can be completed in a single day, sometimes two, and involves a sump pump, perimeter drainage system, a vapor barrier, and, in the case of block walls, weeping holes drilled in the block walls. A battery backup sump pump should also be included to ensure that your sump pump can run during power outages or a blown fuse. A battery backup sump pump can also offer you protection if your primary sump pump fails for any reason. Click to learn more about sump pumps in Pennsylvania. A PVC drain, such as the innovative French Drain System provided by Bowman Masonry & Waterproofing, can effectively direct flooding basement water to the sump pump while resisting clogging. If you live in Tyrone, Port Matilda, Kersey, Brockway, Ridgway, Pennsylvania Furnace and would like a FREE, no-obligation basement concrete block wall waterproofing estimate, call or contact us today! Bowman Masonry & Waterproofing of Pennsylvania specializes in leaky basement waterproofing -- we have the experience, equipment, and best practices you need to keep your basement dry all the time!